You don't need me to tell you how rapidly information flows and what a challenge it is to stay abreast of new developments, changes, innovations, EDC, SHRP2, noteworthy practices, ways of doing business, etc. Yet as the safety engineer for your unit, you are expected to stay in tune with rapidly evolving developments. We can help. FHWA's Roadway Safety Professional Capacity Building Website (http://rspcb.safety.fhwa.dot.gov) is designed and maintained to help you stay in tune. The site includes the Roadway Safety Noteworthy Practices Database, which lets you search by State or by topic for innovative, data-driven projects your peers around the country are undertaking in the realm of highway safety. FHWA and the Roadway Safety Foundation recently presented the 2013 National Roadway Safety Awards (read more about the winners on page 3), and we are currently adding those practices to this database. To learn directly from those who have piloted these practices, you can request Peer-to-Peer (P2P) Technical Assistance on a broad range of topics. You can apply right online, and the program requirements are clear and straightforward. Support can range from a simple phone conversation with a practitioner to a facilitated peer exchange. You can also browse reports from previous P2P exchanges. We offer a broad spectrum of training, and you can find links to what's available from FHWA and from many of the professional organizations that provide an impressive array of capacity building opportunities. If you want to routinely interact with your peers on a particular topic, the portal to these Communities of Practice is available. We started with the Safety Data Community of Practice and will be expanding to other topics. I encourage you to use the RSPCB website to stay in tune, and don't hesitate to tell us what we can do better. The 93rd Annual Transportation Research Board meeting in Washington, DC was a great opportunity for FHWA's Office of Safety to highlight its many resources. Several staff members from the FHWA Office of Safety participated in sessions, sat on panels, and led demonstrations of current highway safety projects. 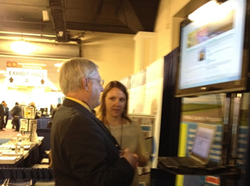 Tamiko Burnell gave a guided tour of the Roadway Safety Professional Capacity Building website (http://rspcb.safety.fhwa.dot.gov/archives). Heather Rothenberg co-chaired the committee on Women's Issues in Transportation. The committee was honored with a Blue Ribbon Award this year for Community Building and Mentoring, receiving the award at the Deen Distinguished Lecture and Presentation of Awards on Monday night. Mshadoni Smith presented at the ANB 25-Highway Safety Performance Committee meeting on FHWA activities and initiatives and provided updates on the MAP-21 NPRM progress and impacts of changes in value of statistical (VSL) life calculations. Nick Artimovich participated in the AFB20 Roadside Safety Design Committee meeting, AFB20 subcommittees, lectern sessions, and the FHWA Roadway Departure Team Meeting. He also met with manufacturers of roadside safety hardware and engineers from the crash test laboratories to discuss upcoming developments in their products and what crash testing may be most appropriate. Finally, Artimovich joined other members of the AFB20 Computational Mechanics Subcommittee and participated in the Finite Element Analysis Workshop held at George Mason University on Thursday. The workshop discussed the latest developments in computer modeling for roadside hardware and vehicle impacts. Karen Scurry presented FHWA's systemic tool at the third annual workshop on the Systemic Approach to Safety. She also shared the results of the Assessment of Local Road Safety Funding, Training and Technical Assistance at the Rural Road Safety Research and Practical Applications. Robert Ritter's presentation highlighted a compendium of State target-setting practices during the National Performance Measures for Highway Safety: Roundtable Discussion. U.S. DOT staff presented information and answered questions on safety performance management requirements in MAP-21. The discussion included NHTSA's Interim Final Rule implementing MAP-21 safety performance management requirements as well as noteworthy practices and methodologies. Cathy Satterfield presided at the paper session, Safety and Behavioral Impacts of Roadway Visual Information, co-sponsored by the Visibility Committee (AND-40) and the Vehicle User Characteristics Committee (AND-10). Gabe Rousseau and Tamara Redmon served on both the Pedestrian (ANF10) and Bicycle (ANF20) Committees. The (shared) aim of the two committees is to make walking and bicycling safer and more convenient transportation modes. Guan Xu gives a guided tour of USLIMITS2. 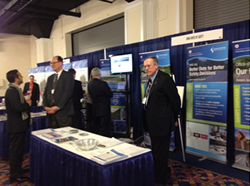 Nick Artimovich and Ray Krammes staff the booth while Karen Scurry gives a demo of the Systemic Tool. 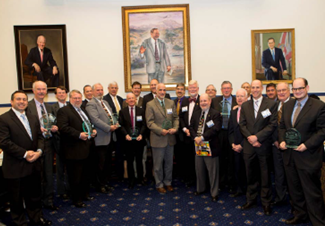 On November 6, 2013, the Federal Highway Administration (FHWA) and the Roadway Safety Foundation (RSF) recognized eleven exemplary highway projects and programs from across the country as winners of the biennial National Roadway Safety Awards. An additional project received an honorable mention. "All of you here today are our partners on the frontlines," said John Porcari, then-Deputy Secretary, U.S. Department of Transportation, who served as the keynote speaker. "You're doing the hard work, day in and day out, of preventing injuries and saving lives— there's no question that your efforts are making a difference. America's streets and roads are safer than ever before, with highway fatalities and injuries near record lows." "The projects we are recognizing today, your projects, have real, tangible results," said Tony Furst, Associate Administrator, FHWA Office of Safety. "They are innovative. They save lives. They reduce injuries. They save time and money. They teach about the critical importance of safety. And they help others who want to follow your examples." "We want to give national recognition to the people who are behind these life-saving projects and programs," said Gregory Cohen, Executive Director of the Roadway Safety Foundation. "No one will know exactly whose lives were saved and whose injuries were prevented because of the work of these heroes. For that reason, these safety professionals are rarely recognized in the way other heroes are, but they remain dedicated to saving lives every day." For more than a decade, the Federal Highway Administration and the Roadway Safety Foundation have partnered to sponsor this prestigious, national awards program. Every two years, this program recognizes the "best of the best" using effectiveness, innovation, and efficient use of available resources as criteria for determining the winning projects. The Tennessee Department of Transportation was recognized for its systematic application of J-Turn intersections to restrict access and minimize points of conflict as a means of reducing high rates of statewide intersection-related crashes. The agency's implementation of new J-Turns at four locations led to an impressive 81% reduction in overall crashes and a 100% reduction in fatalities. Interstate Road Management Inc. (IRM) was recognized for its work with the Kentucky Transportation Cabinet (KTC) on a program to apply a high friction surfacing treatment (HFST) to 26 pilot locations and 75 locations statewide to improve pavement friction and reduce roadway departure crashes on horizontal curves. When compared with previous 3-year crash data, wet-weather roadway departure crashes dropped from 357 to 33 at sites where HFST had been applied. The Alabama Department of Transportation received an award for its program to systematically install raised pavement markers (RPM) on rural roads to improve sight distance recognition and provide guidance along the edge of the pavement, especially during wet weather conditions at night. Based on 2009-2012 crash data, crashes on the initial 10 roadways treated dropped from 224 to 33, fatalities dropped from 7 to zero, and injuries dropped from 152 to 10. After attaching an inspection panel from CLRP's inspection kit to a sign, a simple hand-held flashlight is used to inspect a sign's retroreflectivity against the inspection panel (actual inspections are performed at night). Cornell University Local Roads Program (CLRP) was recognized for its project involving three County Highway Departments in western New York. This project created a sharing agreement that gave each agency access to a retroreflectometer to inspect local signs in support of the new Manual on Uniform Traffic Control Devices (MUTCD) sign retroreflectivity standards. As part of this project, CLRP developed 50 sign inspection kits, each costing less than $50 that the counties used to quickly and accurately perform nighttime sign inspections. This resulted in reduced overtime costs and reductions in the number of unnecessary sign replacements each year. The State of Connecticut received an award for its efforts to replace a number of old rotaries with modern roundabouts as a means of reducing speeds and improving safety at these sites. Comparing the latest available 3-year period (2009-2011) crash history at the Route 80 at Route 81 roundabout to the 2005-2007 rotary data, the total number of crashes was reduced from 20 to 10, the number of injury crashes was reduced from 6 to 1, and the number of injuries was reduced from 7 to 1. The Idaho Department of Transportation was recognized for its project to develop a first-of-its-kind Winter Performance Measure system. This program was designed to measure the effectiveness of winter weather treatments and their impact on driver safety and mobility. IDT's use of this program has contributed to a reduction in roadway departures that occur specifically because of icy road conditions—a leading cause of highway fatalities in Idaho—by more than 40 percent in southeast Idaho, where WPM was first implemented. The Washington State Patrol (WSP) and the Washington State Department of Transportation (WSDOT) were recognized for their efforts to reduce the number of fatal and injury accidents involving commercial vehicles on Washington State roadways using a modified commercial-off-the-shelf technology to create the Automated Infrared Camera System (AIRS), an automated brake inspection tool. Using a camera system embedded into the roadway, AIRS inspects each commercial vehicle's brake system as it enters a weigh station at ordinary travel speeds. The Idaho Transportation Department (ITD) received an award for its innovative, data-driven program to conduct safety analyses on roadways throughout the State—an effort encompassing 5,000 miles of roadway across six districts. Building on a pilot effort to examine rural road safety, this program reevaluated the way safety projects are assessed and ranked to improve both cost effectiveness and overall safety results. As a result, the agency was able to develop a list of ranked safety improvement projects reflecting the most effective use of funding for safety projects. Rutgers' Center for Advanced Infrastructure and Transportation (CAIT) Transportation Safety Resource Center (TSRC) was recognized for its efforts to increase New Jersey's focus on local and regional high-crash locations. CAIT engineers conducted focused screenings to identify regional high-crash locations and communicated with local authorities to obtain inputs about perceived risk. The results formed the basis for a proactive approach that incorporated both local perceptions of risk and crash history as opposed to crash history alone. Working with New Jersey's Road Safety Audit program, CAIT and its local and regional partners have brought about an increased focus on intersection and pedestrian safety and helped provide tailored solutions to each problem area. The South Central Regional Transportation Safety Plan (SCRTSP) was recognized for being the first regional, data-driven action plan developed in Louisiana as part of the State's efforts to implement its Strategic Highway Safety Plan (SHSP). Created with the support of Federal, State, and local agencies, the action plan helps to identify regional and local projects that will address four safety emphasis areas: occupant protection, alcohol-related driving, crashes involving young drivers, and infrastructure. As a result of the SCRTSP, there have already been measured reductions in alcohol-related serious injuries as well as in serious injuries resulting from lack of seatbelt use. In 2012, the Genesee County Road Commission (GCRC) in Flint, Michigan, received an award for its efforts to initiate a comprehensive safety improvement evaluation using the U.S. Road Assessment Program (usRAP). Assessing data on over 40 existing safety-related infrastructure elements for more than 8,600 300-ft roadway segments, the usRAP software evaluated nearly 70 crash countermeasures for each 300-ft segment. Based on this thorough review, program staff identified those countermeasures that made the best sense for the location and then selected the most cost-effective countermeasures for inclusion in a safety improvement plan. The Commission completed development of the plan in early 2013 and is proceeding through the programming and implementation stage. The Safe Roads Alliance received an honorable mention for its work with State department of motor vehicles (DMV) staff from around the country, highway safety researchers, academics, behavioral scientists, educators and parents and teens to develop the best-practices-based Parent's Supervised Driving Program (PSDP). Currently available in 13 States, the program includes step-by-step instructions for parents on how and what to teach their teen during the supervised driving process, including practicing in a variety of conditions and focusing on higher order driving skills. The Office of Safety's new higher education section of the Roadway Safety Professional Capacity Building (RSPCB) website offers direction, insight and resources to recruit and develop the next generation of safety professionals. 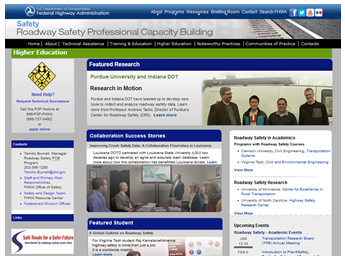 Roadway Safety Professional Capacity Building website targets students, universities, and safety professionals. Launched early this year, the site is a central place to highlight research, tell success stories, and detail effective multi-disciplinary collaborations. It serves as a powerful tool linking the work of universities and research institutions with safety professionals in the public and private sectors to speed the dissemination of potentially lifesaving information. It also provides an atmosphere conducive to sharing information and embarking on innovative solutions to safety issues. "This website serves as a place where people can come and learn about what universities are doing in the field of roadway safety and how they are collaborating with state and private partners," said Tamiko Burnell, RSPCB Program Manager. "It shows what types of students are going into the transportation safety field and what they are majoring in as part of the transportation community related to safety." For the student looking to enter the field of roadway safety, the RSPCB is an indispensable resource for locating both undergraduate and graduate degree programs. Additionally, students are able to read about other students' successes as well as communicate with current safety professionals and academics to get answers to their questions and find encouragement to pursue a career in safety. The website links to universities and institutions that have roadway safety courses as well as degree programs or clusters of workshops. "The criterion for listing a university is that they have a link dedicated to highway safety courses," said Burnell. "One of the things we noticed over the past year is that we were not reaching universities in the research sector at the level we would like," said Burnell. "We found that there was a need for more collaboration and that has been the driving force behind this new initiative." Featured Research. This section that highlights significant research going on in roadway safety. It also features academic programs and professors. It highlights where the university is moving in terms of cultivating transportation roadway safety as an option for a profession. Collaboration Success Story. This section features stories about the collaboration between universities and the private and public sectors. This is a place where universities can promote what they are doing and find out what other institutions are doing so they can collaborate on projects they have in common. Featured Student. This section is dedicated to highlighting graduate or doctoral students. It gives these students an opportunity to talk about their path and how they got interested in roadway safety. Students share some of the things they worked on and what they are doing today and hope to do in the future. Unfortunately, most of us have likely tried to use poorly maintained pedestrian facilities at some point in time. If you ever wanted to know things like who maintains the sidewalk or how to get that curb ramp fixed, then a new FHWA resource may be of interest to you. The FHWA Safety Office recently released the Guide for Maintaining Pedestrian Facilities for Enhanced Safety, the primary goal of which is increasing safety and mobility. The guide addresses the needs for pedestrian facility maintenance; common maintenance issues; inspection, accessibility, compliance, and plans and policies; maintenance measures; funding; and construction techniques to reduce future maintenance. One way that the FHWA promotes pedestrian safety is by encouraging States to provide and maintain accessible sidewalks or pathways along both sides of streets and highways in urban areas, particularly near school zones and transit locations, and where there is frequent pedestrian activity. Although there are guidelines and standards to aid in the design of pedestrian facilities, it can be difficult to adequately maintain facilities once they are in place so they remain safe and usable. Many jurisdictions have laws or ordinances addressing pedestrian facility maintenance, typically requiring the adjacent property owners to remove vegetation encroaching into sidewalks and to maintain and repair damaged sidewalks adjacent to their property. However, the property owner requirements and the enforcement of these regulations may vary widely from jurisdiction to jurisdiction. Maintenance of shared use paths is more complicated still, since the agencies that are responsible for them don't always make a practice of monitoring them and making sure they are in safe and passable condition. Furthermore, Federal funding is not available for maintenance activities, and State and local government agencies are operating with severely constrained resources for monitoring and maintaining sidewalks and other pedestrian facilities. Not only is this a problem relating to walkability and accessibility, but there can be a severe liability consequence related to poor, inadequate, or infrequent monitoring and maintenance of pedestrian facilities. Until this guide was complete, there was no national resource on pedestrian facility maintenance and best practices, other than what some states and localities had developed themselves. The guide identifies best practices and barriers for sidewalk and shared use path maintenance: what works and what does not work based on experience from State and local agencies. It also provides examples and experiences from jurisdictions that have developed effective policies for selecting and maintaining pedestrian facilities in terms of responsibilities, enforcement, allocation of costs, and related issues. The guide provides examples and experiences from jurisdictions that have developed effective policies for selecting and maintaining pedestrian facilities in terms of responsibilities, enforcement, allocation of costs, and related issues. There are a number of jurisdictions that are using innovative practices to accomplish high-quality, cost-effective pedestrian facility maintenance. For example, some communities have initiated cost-sharing arrangements with private property owners or have developed equipment, materials, and procedures specifically designed for the sidewalk environment. Case studies feature Hoboken, New Jersey; Madison, Wisconsin; Fond du Lac, Wisconsin; Boston, Massachusetts; Brookline, Massachusetts; Santa Monica, California, and several others. An associated research report, entitled Guide for Maintaining Pedestrian Facilities for Enhanced Safety Research Report, includes a literature review, a detailed review of local maintenance programs gained through discussions with 50 municipalities and state agencies, and an overall assessment of the current practice of pedestrian facility maintenance. Both the guide and the research report, as well as many other tools and resources, are available at: http://safety.fhwa.dot.gov/ped_bike/tools_solve/. For more details on these documents or the FHWA Office of Safety's pedestrian safety program, please contact Tamara Redmon at tamara.redmon@dot.gov. 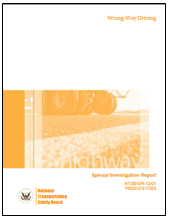 For the past decade, transportation agencies have been very proactive in using Road Safety Audits (RSAs), which are formal safety performance examinations of either existing or future roadways. For roads that are not yet built, the critical question has been how to make it easier to identify potential safety improvements for transportation facilities before they are even constructed. One way to do this is by using three-dimensional (3-D) design visualization. To help Federal, State, local, and tribal agencies understand the benefits of using interactive 3-D visualization to assist RSA teams in assessing the safety effects of potential roadway designs, FHWA has just released Road Safety Audit Case Studies: Using Three-Dimensional Design Visualization in the Road Safety Audit Process. While compromises and trade-offs are a normal part of the planning and design decision-making process, RSAs ensure that safety does not "fall through the cracks." RSAs are also an ideal tool to ensure effective stewardship of funding; it's more cost-effective to incorporate safety in the beginning than to reconstruct after a project is built. However, performing an RSA during the pre-construction phase can present some challenges. Typically, an RSA team will review plans and specifications in a two-dimensional (2-D) format. For team members who have not been trained in interpreting these diagrams or who do not use construction plans on a regular basis, it may be difficult to fully understand the overall design depicted in a set of plans and envision safety concerns. In addition, design drawings do not always convey risk factors that might exist once the facility is built. To demonstrate the effectiveness and benefits of using 3-D visualization with RSAs, the FHWA Office of Safety worked with four jurisdictions to pilot the process (see table). For each project, a 3-D model of the proposed concepts and designs was developed using digital terrain models, design surface models, associated 2-D or 3-D computer-aided design (CAD) files, and other information necessary to create a detailed rendering of the proposed roadway and surrounding environment. The model also included signs, pavement markings, traffic signals, lane configurations, major landscaping, roadside appurtenances, and other items within the right-of-way to render a realistic visualization of the roadway and its environment. For example, a drawing might not reveal that a structure located in the right of way constricts sight distance. This is where a 3-D model of the project can offer significant benefits. The RSA team can easily rotate 360 degrees during the review and virtually walk or drive through the design. This allows the team to visualize the project design realistically and identify elements that may pose a safety concern to future road users. The RSA team members used the 3-D model to visualize the project and identify elements that may pose a safety concern to future road users. A variety of recommendations stemmed from the pre-construction RSAs using 3-D visualization, including adding additional left-turn lanes; restricting left turns from side streets; tightening channelized right-turn movements; and identifying alternative route options, cross-section options, intersection/ interchange treatments, and pedestrian/bicycle routing and facility options. To learn more about using 3-D visualization with pre-construction RSAs and to read case studies from the four pilot locations, download a copy of Road Safety Audit Case Studies: Using Three-Dimensional Visualization in the Road Safety Audit Process at http://safety.fhwa.dot.gov/rsa/case_studies/fhwasa14003/. Each case study includes photographs, project background, key RSA findings and suggestions, and the benefits of the 3-D visualization. This newest publication will help agencies integrate this innovative technology into their RSA process. For more information about using 3-D visualization in pre-construction RSAs, please contact Becky Crowe at 804-775-3381, or rebecca.crowe@dot.gov. The Strategic Highway Safety Plan (SHSP) is a major component and requirement of the Highway Safety Improvement Program (HSIP). It is a data-driven, comprehensive highway safety plan that establishes statewide goals, objectives, and key emphasis areas, and aims to integrate the four E's of highway safety: engineering, education, enforcement and emergency medical services (EMS). Highway safety professionals are comfortable using engineering, education, and enforcement approaches in highway safety planning and project implementation. However, the fourth E-EMS-is typically less familiar to them and consequently is represented less often in the SHSP process. But EMS is just as important as the other three E's. EMS contributes to reducing death and disability in the post-crash phase, providing the last pre-hospital opportunity to improve health outcomes from motor vehicle crashes and other medical emergencies. Supporting a well-functioning EMS system and engaging the state EMS office in the SHSP process are key strategies for reducing highway fatalities and serious injuries on all public roads. Outreach to both the highway safety and EMS communities is needed to better bring the two professions together during the SHSP process and toward the common goal of reducing deaths and the severity of injuries on our nation's roadways. 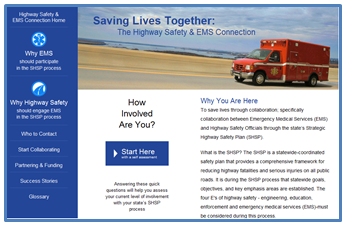 FHWA's "Saving Lives Together: The Highway Safety and EMS Connection" web page. Speeding—whether driving in excess of the posted speed limit or simply traveling too fast for road conditions—is a factor in an estimated one-third of all fatal crashes. Setting and enforcing speed limits are the most widely used methods for managing speed and ultimately in reducing speeding-related crashes. However, to be effective, speed limits must be set to correctly reflect the maximum reasonable and safe speed. The FHWA web-based tool, USLIMITS2, can help communities establish appropriate speed limits. FHWA's New USLIMITS2 Web Page. The Manual on Uniform Traffic Control Devices (MUTCD)–the national standard for signing and marking on all public roads–requires that speed limits in speed zones be based on an engineering study of free flow speeds and recommends that speed limits be posted within 5 mph of the 85th percentile speed of free-flowing traffic. Motorists who drive faster contribute disproportionately to crash and injury risk. Setting a speed limit 5 mph higher will make few additional drivers legal but setting it 5 mph lower will make technical violators out of the nearly half the drivers. The MUTCD also lists other risk factors including road geometry, the pace speed, roadside development, parking practices, pedestrian activity, and crash experience that may be considered but does not provide specific guidance on how to account for these variables. The subjectivity of the process often leads to inconsistencies in posted speeds and makes it difficult to defend speed zoning decisions when public pressure comes to bear. USLIMITS2 is a quantitative, web-based tool designed to help practitioners objectively and consistently account for the myriad factors bearing on the process for determining reasonable and safe speed limits. The software employs a risk-based set of decision rules using roadway, traffic, and crash data input by the user to recommend credible, safe, and enforceable speed limits for a specific segment of roadway. USLIMITS2 is applicable to all types of roads ranging from local roads and residential streets to freeways. It provides recommended speed limits based on site characteristics, which include such variables as access density, pedestrian activity, roadside hazards, operating speed, and crash history. It also provides relevant warnings in a summary report that includes suggested actions for addressing areas of concern. Users of USLIMITS2 include State and local governments, law enforcement agencies, and consultants. Wisconsin's Statewide Speed Management Guidelines recommends that all jurisdictions in the state use USLIMITS2 as a starting point for determining appropriate speed limits. In Georgia, local police cannot use radar or other speed detection devices to enforce speed limits on any State route, county road, or city street unless the speed zone was established on the basis of a traffic engineering study and approved by Georgia DOT. Georgia District offices routinely use USLIMITS2 in reviewing and approving the speed zones recommended by the local agencies. The tool's broad applicability and ease of use make it an important resource in any speed zoning study. Access the USLIMITS2 web-based tool at: http://safety.fhwa.dot.gov/uslimits/. To learn more about the USLIMITS2 web tool or FHWA's speed management program, please contact Guan Xu at guan.xu@dot.gov. The FHWA Office of Safety – Intersections Program has been busy working on a number of activities lately. In addition to advancing Intersection & Interchange Geometrics through the Every Day Counts initiative and continuing to promote the latest Proven Safety Countermeasures, there are two notable activities that are worthy of recognition. First introduced in 2004, the popular Signalized Intersections Informational Guide, and the accompanying workshop available through the National Highway Institute (course number 380078, http://www.nhi.fhwa.dot.gov/training/course_search.aspx?tab=0&typ=1&course_no=380078&sf=1), have both been updated. The new guide and workshop materials have been revised to reflect the latest information from a wide array of related policies, manuals, research and best practices in order to continue to serve practitioners as the go-to reference for evaluating the safety, design and operation of signalized intersections. Intended to form the foundation for building safer and more efficient signalized intersections that consider and accommodate all users and modes, the guide is arranged in three parts: fundamentals, project process and analysis methods, and treatments. There is a heavy emphasis on human factors and user needs, and the importance of pedestrian and bicycle considerations is stressed throughout the guide. The strategies and treatments discussed in the guide range from low-cost measures such as improvements to signal timing or signing and markings, to high-cost measures such as intersection widening or reconstruction. Many of the treatments are worthy of systemic implementation. 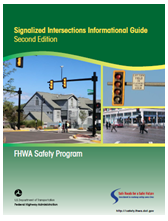 To review or download the updated Signalized Intersections Informational Guide, please visit http://safety.fhwa.dot.gov/intersection/conventional/signalized/fhwasa13027/index.cfm. Participating in the first-ever Wrong-Way Driving Summit that was held in Edwardsville, Illinois, this past July 18-19, 2013. The WWD Summit was sponsored and hosted by the Illinois Center for Transportation (ICT), the Illinois Department of Transportation (IDOT) and Southern Illinois University Edwardsville (SIUE). This event brought together over 120 traffic safety professionals representing 23 states, from Federal and State transportation agencies, academia, law enforcement, consulting and industry, to share and discuss the "four E" (engineering, enforcement, education, and emergency services) approaches to addressing WWD. The proceedings from the WWD Summit will be published by the ICT. Developing a Wrong-Way Driving RSA Prompt List to aid practitioners and safety professionals in the field with diagnosing sites for WWD risks. This WWD Prompt List follows in the same format of Road Safety Audit (RSA) prompt lists developed previously by FHWA, but with a specific focus on the issues and challenges associated with, and potential mitigation for, wrong-way driving scenarios. Forming a joint partnership with the American Traffic Safety Services Association (ATSSA) to produce a new publication tentatively entitled "Emerging Safety Countermeasures for Wrong-Way Driving," to be unveiled at the ATSSA Annual Convention & Traffic Expo (http://expo.atssa.com/) in San Antonio, Texas, in late February 2014. Supporting development of a wrong-way driving informational guide that will soon be published by ICT and IDOT. This guide will serve as a comprehensive, national resource for addressing wrong-way driving. 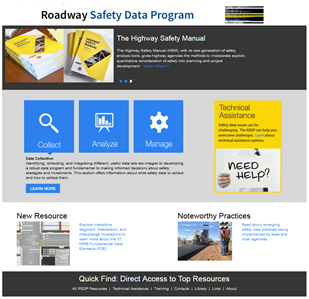 FHWA's Roadway Safety Data Programs team is excited to announce the launch of its newly designed Website, which went live in January at http://safety.fhwa.dot.gov/rsdp/. The site's home page welcomes visitors with a clean, uncluttered design and with featured content focused on our mission to provide our customers with the most accurate program information and share knowledge and expertise. The new site is divided into three main sections: Data Management, Data Collection, and Data Analysis, making it easier for customers to locate and view information relevant to their interests. It has been the program's primary goal in developing this new site to include easier navigation to content, technical assistance applications, and noteworthy practices, but also for the site to serve as a resource for safety data professionals. The website will be updated on a regular basis, with new reports, projects, and other new content. Stay tuned, check the site often, and share the site with your colleagues as we will be adding new materials for our customers to use in improving their safety data capabilities. If you experience any problems using the new website or if you have any suggestions, please contact stuart.thompson@dot.gov. Help is available through the NEW Safety Data & Analysis Technical Assistance Program! This program brings technical assistance, training, and resources help agencies develop analyses that integrate crash, road inventory, and traffic data to pinpoint vital safety improvements in a holistic way. Agencies can get answers to nearly any safety related question—from general questions, such as how to review and improve roadway data inventories, to specific questions, such as which statistical models are best to address crashes at a complicated intersection. State and local transportation agencies receive formal and informal technical analysis help in a flexible format, including one-on-one sessions with experts. Quarterly webinars open to representatives from State and local transportation agencies cover broader data topics to supplement the individualized sessions. Apply for Data and Analysis Technical Assistance at http://safety.fhwa.dot.gov/rsdp/technical.aspx or contact Mshadoni Smith at mshadoni.smith@dot.gov for more information. 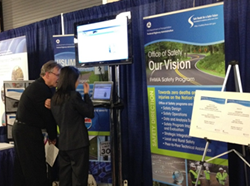 ATSSA's 44th Annual Convention & Traffic Expo, San Antonio, Texas, February 21-25, 2014. The ATSSA Annual Convention and Traffic Expo brings together Roadway Safety professionals and vendors in fields such as pavement marking, computer software, protective clothing, and ITS. Workshops will address a wide range of safety-related topics including mitigating wrong way driving, pedestrian access in work zones, use of truck-mounted attenuators (TMA) in work zones, work zone performance measures, and pavement markings and features. 4th International Conference on Roundabouts, Seattle, Washington, April 16-19, 2014. This TRB-sponsored event will explore innovative and effective uses of roundabouts to help enhance the safety and efficiency of intersections. 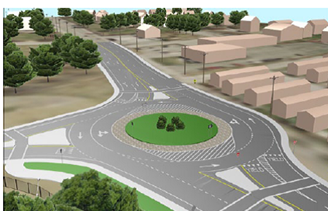 The meeting will also examine the international influences on North American roundabout design practices. For more information or to register, visit http://www.cvent.com/events/4th-international-conference-on-roundabouts/event-summary-2e5b6fd91dad4034b8060caa11f35315.aspx.